Why what have we here? Pretty little bowls of light-as-air fluffy goodness? Smoothly sweet from the white chocolate ganache with a delightful tartness from the berries and a flavour reminiscent of turkish delight, this is, simply put, a bowl of heaven. Please come in, have a seat, make yourself comfortable. I'll put on some Edith Piaf for us or perhaps some Enya to delight our ears while our tongues curl in ecstasy around these soufflés. What is the occassion, you ask? 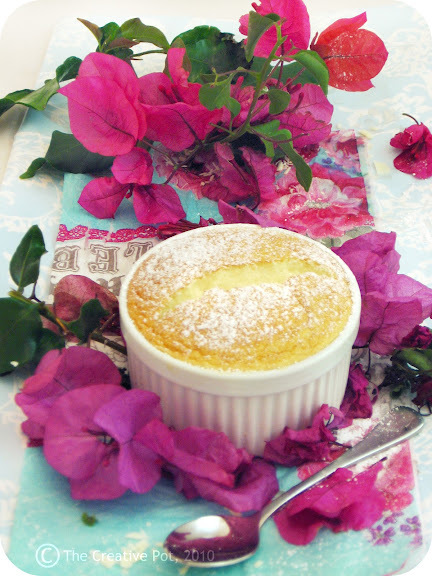 Well, Dave and Linda from Monkeyshines in the Kitchen chose soufflés as our November 2010 Daring Cooks’ Challenge! Dave and Linda provided two of their own delicious recipes plus a sinfully decadent chocolate soufflé recipe adapted from Gordon Ramsay’s recipe found at the BBC Good Food website. And while the savoury soufflé recipe sounded divine, there was only ever one option for this blogger. I mean, look at my twitter bio. See that there? It says "chocoholic". So, needless to say, the chocolate soufflé it was. I found a bag of frozen berries (yes, I know, it's practically sacrilege) in the freezer and, even though it seems like such a shame (after all we have fresh berries galore! ), I decided to include them in my dessert. Layered in the bottom of my teeny-tiny ramekins (well not *that* tiny, but I'm trying to work the dainty angle here), drizzled with a splash of crimson coloured rose syrup, they formed the perfect base for the airy-light confection that would eventually settle on top of them. Now, normally I'm a die-hard dark chocolate kinda gal, but with the berries in mind I decided that a white chocolate would be the perfect partner to showcase the lovely colour of the berries. Yes, even frozen berries are pretty, thankyouverymuch! 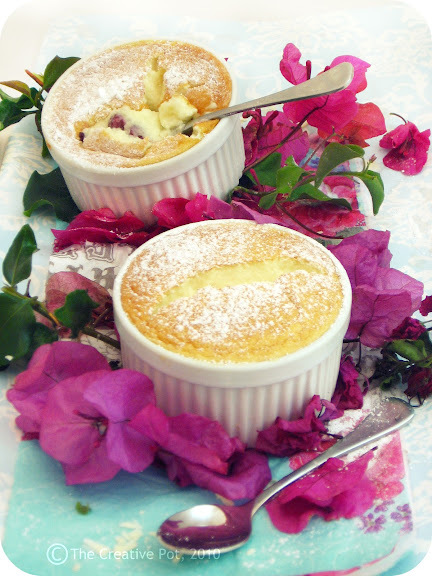 This was my first time making a soufflé, so I paid extra attention to the recipe, making sure I included all the ingredients and even more importantly, all in the right order. I even had a pen on hand to check off each ingredient and each step as I used it/completed it. Well. Sometimes the best laid plans don't ah... quite work out as planned. You see, I was multi-tasking on this specific occassion. Making a frittata with some of the leftover egg yolks, dividing up yolks and whites in somewhat of a rush (the hungry monster was screaming at top volume at this stage). And then it happened. That damn yolk went and invaded my pristine egg whites. Agony! Of course I immediately scooped out the offending piece of yellow slime, but it was too late. My whites, although they did get fluffy and airy and all of those sought-after qualities, did not come close to "stiff peak" stage. But, I threw 'em into my ganache regardless. Well, okay, I folded them in ever so gently. Hell, I wasn't going to screw this up even more. And you know what? My soufflés *did* rise. Granted, not as high and mighty as I would've liked them too, but hey, nobody's perfect. I can tell you though that the slightly less impressive rise had absolutely no effect on the taste and texture of these babies. Yes sirree, they were lighter than featherlight. So, I'm going to mark this off as a success. After all, looks aren't everything, right? Right. PS: Making this recipe will make you feel super fancy as you prance around saying crème patisserie and ganache and giving anyone who dares enter your zone a withering stare. So, enjoy it. After all, it's not every day that one gets to feel like an elegant French lady in the kitchen. Oui oui mademoiselle! 1. Heat oven to moderate 190 ˚C (375 ˚F). 2. Grease ramekins with butter, then tip a little icing (confectioners' sugar) into each ramekin, tilting it to cover the sides as well. 3. 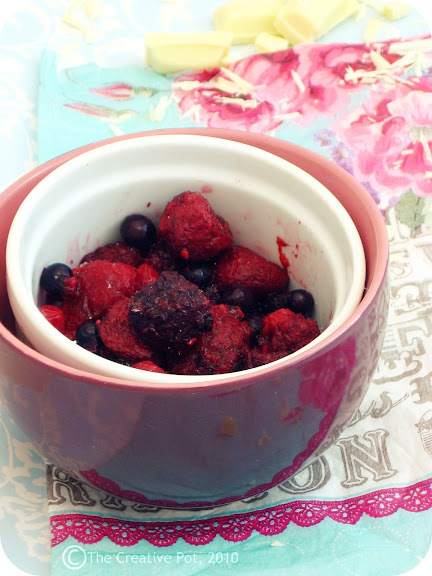 Toss berries with rose syrup, then place a few berries in the base of each ramekin. 4. For the crème patisserie, mix the flour, corn starch and sugar in a medium sized mixing bowl. Beat egg yolk and whole egg together and add to the flour, mixing to a smooth paste. 5. Combine milk and cream in a small bowl and place in the microwave on high heat for approximately one and a half minutes (it should be close to boiling point). Mix chocolate in, stirring until chocolate has fully melted and there are no lumps. 6. Add chocolate mixture to your egg paste, stirring to ensure it is evenly combined. 7. Now prep your egg whites by placing them into a large mixing bowl and whisking until soft peaks form. Gradually add sugar and keep on whisking until stiff peaks form. This is what will give your souffles volume. 8. Stir about 2 tbsp of the egg whites into the crème patisserie. Carefully fold in a third of the rest, cutting through the mixture. Fold in another third (take care not to lose the volume), then fold in the rest. The mixture should look light and airy. 9. Spoon the souffle mixture into the dishes, then place in the oven and bake for 15 - 17 minutes. 10. The soufflés will be firm on top, but should have a slight jiggle when moved. They should have risen by about two thirds of their original height and jiggle when moved, but be set on top. Be careful not to let any of the egg yolk contaminate your egg whites or you will be unable to reach the "firm peak" stage. All this means is that, instead of your souffles rising high and mighty above the top edges of the ramekins, they will just shyly peek over the edge, like mine. This does not affect the taste in any way, but does make for a far less dramatic presentation. So, do as I say, not as I do. I've seen a quite a few of the Daring cooks souffles recently and, not that I play favorites or anything, but I think I like these best! I love the white chocolate berry combo. Just perfect for my WHITE chocoholic taste buds! Brilliant Marisa!! I love the dessert, but I must say your witty writing style is just awesome!! Oh... my... word. I hate you right now. Looks so divine! They're lovely, aren't they? 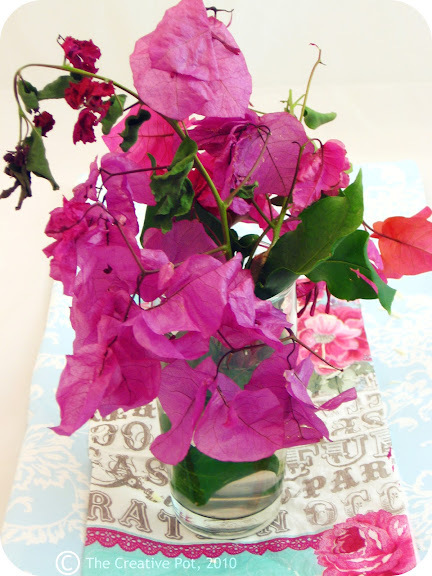 Reminds me of my gran - she used to have two big bougainvilleas on each side of her front door. Oh wow! These look and sound amazing! Pretty, pretty! Great pairing the white choccie with berries. With food styling, practise makes perfect! And after a while it comes naturally. Très joli, je suis impressionné ! Wow, dis impressive. Souffles is eintlik lieflik, jammer mens maak dit nie meer dikwels nie. hi mariza. my first souffles and they came out ok. i made 7 ramekin's worth with this recipe. it was a lot of fun, using strawberries in the bottom (my frozen blueberries went tough as tekkies). it was helluva sweet though. next time i may try dark choc instead, or a lot less white choc.